I’ve previously reviewed A Year with Marmalade so I was delighted to see Marmalade the cat was back in a new children’s picture book. 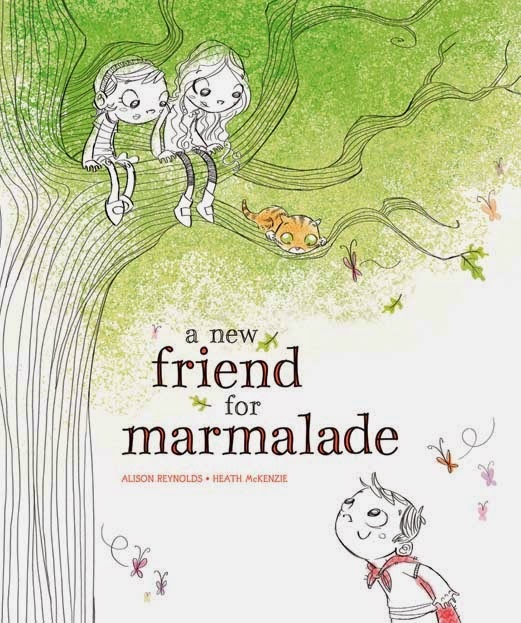 A New Friend for Marmalade was written by Alison Reynolds, illustrated by Heath McKenzie and published by Five Mile Press (2014). This is a story about friendship. It’s about accepting new friends, even when they do things a little differently from you. It’s a story about facing danger which can be overcome with just a little co-operation. There’s a message here about acceptance and differences, but it’s not heavy-handed in the least. Maddy and Ella have a certain way of playing and the advent of Toby introduces some challenges! Children will instantly recognise scenarios that highlight the differences in boy and girl play, they'll giggle over the expressions on the girls' faces, and I believe they’ll also celebrate the strengths Marmalade first perceives in Toby. Things get worse before they get better, but I found myself grinning with sheer delight at the ending. A New Friend for Marmalade is such a lovely, feel-good story! Reynolds’ usual deft writing style is apparent from the start, with lots of strong verbs and vivid details that build word pictures for the reader. McKenzie’s limited colour and sketchy pencil illustrations add to the gentle atmosphere, making this a perfect choice for the under 8s.